This pattern features an unusual 2 piece construction, knitting separate fronts and backs. 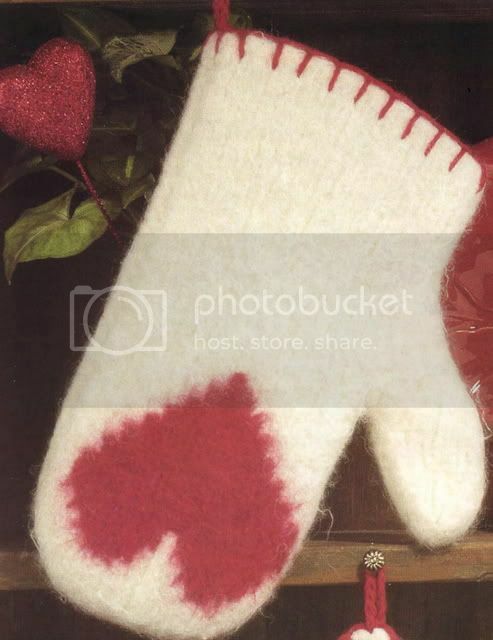 I don’t see why it couldn’t be used to make cold weather mittens as well as oven mitts. Yarn is doubled throughout. Abbreviation M1: Make 1 increase by making a backward loop on right hand needle. With MC, cast on 19 sts. Work 16 rows St stitch. Rows 19-30: Rpt rows 17 & 18 (27 sts). Row 31: K 19, BO 1, K7. Working on 8 thumb stitches only, work even in St stitch for 3 rows. Row 4: K1, ssk, K2, K2tog, K2. Row 6: K1, ssk, K2tog, K2. With RS facing, attach yarn and work on remaining 19 stitches. Row 2: K2, place M, beg Chart, place M, K1, M1. Rows 3-25: Work in St st, following Chart. Rows 26-28: Remove markers,work in MC. Row 29: K1, ssk, k to last 3 sts, K2tog, K1. Rows 31-34: Rpt rows 29 and 30.BO remaining 13 sts. Make second piece, reversing pattern and omitting chart. With RS together, sew pieces of mitt together and weave in ends. Optional: Blanket stitch around edges with CC, placing sts 1/2 inch apart and 1/2 inch deep. Felt using your favorite method. 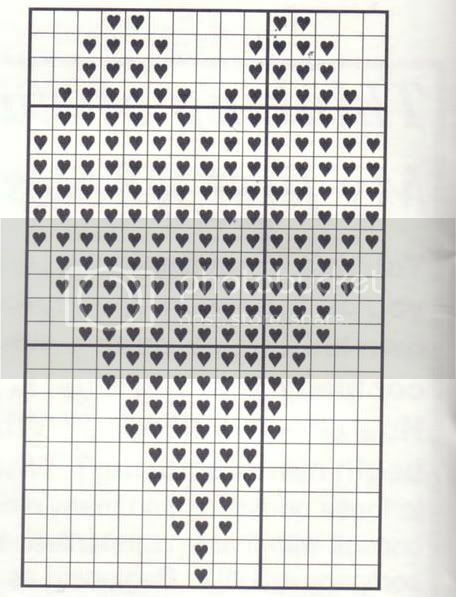 You can easily knit some matching potholders using chart and sizing as desired. Have you discovered the cool site called TipNut ? I subscribe to their newsletter , and guess what I’ve found there? A listing of 42 knitting and 12 crochet patterns for using up all those left-overs from kitchen cotton balls. Cozies, mats, scrubbies, dishcloths, etc, all practical and useful, whether made for gifts or for yourself. A little treasure trove of kitchen stuff! They have other needlework and crafts projects too. A fun place to explore for all kinds of good stuff.